Fearless Ideas: The Campaign for Maryland-The University of Maryland's most ambitious fundraising campaign to-date, will focus on elevating and expanding our mission of service, enhancing our academic distinction, and bolstering a leading-edge research enterprise that has the power to improve the lives of millions. Join us in bringing the Department of Electrical and Computer Engineering to even greater heights by supporting a program that you feel passionate about. Your contribution, no matter how large or small, can have an impact today, and far-reaching impacts for tomorrow. The Electrical and Computer Engineering Chairman's Fund supports student and faculty educational and research departmental needs to discover new knowledge. The Chairman Fund fulfills the area of greatest need. Make a gift to this fund. Students in ECE’s Masters of Engineering and Ph.D. programs are eligible for fellowships. Fellowships allow students to take a hands-on approach to their studies by working on applied research. Students awarded with fellowships work with faculty members throughout their program in a particular subject area. Students often help with complex research problems, and teach classes and labs. Make a gift to this fund. The ECE department is fortunate to be able to offer some our talented undergraduate students scholarships to help offset the cost of their education. Providing scholarships allows the department to be competitive in recruiting the best and the brightest students. Scholarships also provide the opportunity for low-income students to afford their college education. Most scholarships are created from generous gifts donated by alumni, friends and companies. By supporting scholarships, you have the power to transform the student experience. Make a gift to this fund. Students awarded a UTF are selected to work with a professor teaching a lower level course. The UTFs will have done exceptionally well in the course for which they are assigned and have a minimum of a 3.3 GPA. UTFs will spend approximately 12 hours per week helping grade assignments/tests, working with students in the lab, and helping present content. Students will attend training at the beginning of the semester. About 35 students are selected through an application process to be a UTF each semester. Students awarded a URF are chosen to work with a faculty member on a specific, cutting edge research project throughout the semester. This allows students to become experts in a specific subject matter. The students selected are in the last year of their program and have a minimum GPA of 3.3. URFs will spend approximately 12 hours per week working on their research experience. At the end of the year the department hosts a symposium for the URFs to showcase their research. About 10 URFs are chosen to participate in the program each year. To keep abreast with technological trends, advancement in industry, and to remain competitive with other top institutions, the leadership of the ECE Department has committed to making necessary lab improvements on an on-going basis. This includes purchasing state-of-the-art equipment and infrastructure improvements to our current labs. ECE is also committed to creating new labs for students to experiment in and bring their fearless ideas to life. 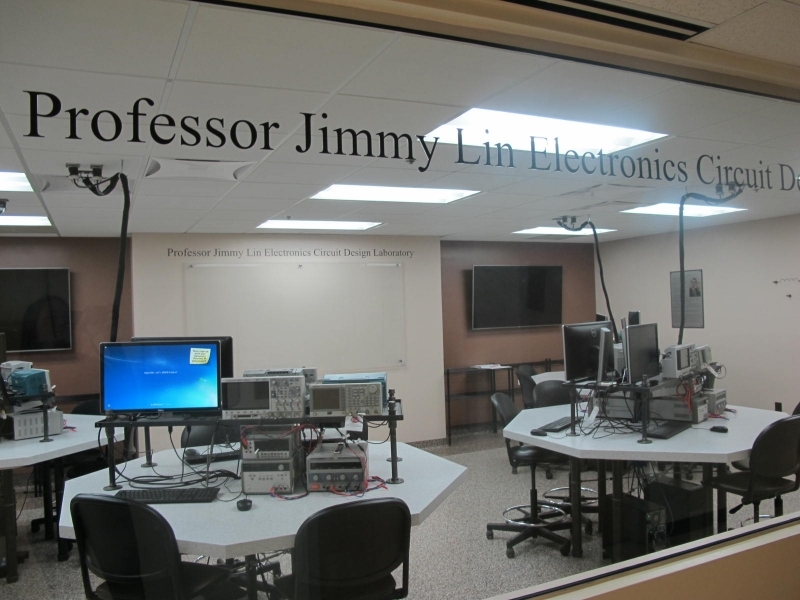 The purpose of the Jimmy Lin Endowment for Entrepreneurship is to provide annual awards to students, staff, and faculty who transform their ideas into innovations through invention and technology commercialization.